Sadeghi, Mehdi, Roshandel Kahoo, Amin, Siahkoohi, Hamid Reza, Nikoo, Azita. (1394). Detecting buried channels using linear least square RGB color stacking method based on deconvolutive short time Fourier transform. مجله ژئوفیزیک ایران, 9(5), 104-112. Mehdi Sadeghi; Amin Roshandel Kahoo; Hamid Reza Siahkoohi; Azita Nikoo. "Detecting buried channels using linear least square RGB color stacking method based on deconvolutive short time Fourier transform". 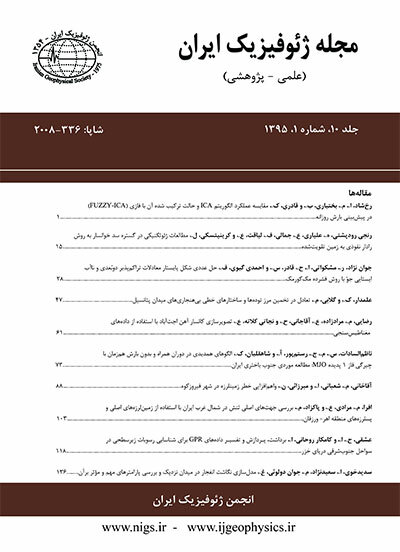 مجله ژئوفیزیک ایران, 9, 5, 1394, 104-112. Sadeghi, Mehdi, Roshandel Kahoo, Amin, Siahkoohi, Hamid Reza, Nikoo, Azita. (1394). 'Detecting buried channels using linear least square RGB color stacking method based on deconvolutive short time Fourier transform', مجله ژئوفیزیک ایران, 9(5), pp. 104-112. Sadeghi, Mehdi, Roshandel Kahoo, Amin, Siahkoohi, Hamid Reza, Nikoo, Azita. Detecting buried channels using linear least square RGB color stacking method based on deconvolutive short time Fourier transform. مجله ژئوفیزیک ایران, 1394; 9(5): 104-112. Buried channels are one of the stratigraphic hydrocarbon traps. They are often filled with a variety of porous and permeable sediments so they are important in the exploration of oil and gas reservoirs. In reflection seismic data, high-frequency components are sensitive to the channel thickness, whereas, low-frequency components are sensitive to the channel infill materials. Therefore, decomposition of seismic data to its spectral components provides useful information about both thickness and infill materials of buried channels.A 4D spectral data is produced by applying spectral decomposition to a 3D seismic data cube which is decomposed into several single frequency 3D cubes. Since different frequencies carry different types of information, each single frequency cube cannot show all subsurface information simultaneously. Therefore, we used color stacking method and constructed RGB plots, which represent more information than single frequency volumes. In this paper, we applied three methods of Deconvolutive Short Time Fourier Transform (DSTFT), S Transform (ST) and Short Time Fourier Transform (STFT) to a land seismic data from an oil field in the south-west of Iran. We used the resulting spectral volumes to create RGB color stacking plots for tracing buried channels. According to the results, the RGB plots based on the DSTFT method revealed more details than the ST and STFT methods. Auger, F., Flandrin, P., Goncalves, P., and Lemoine, O., 1996, Time-frequency toolbox for use with MATLAB, CNRS, France. Bahorich, M., A.Motsch, K. Laughlin, and G. Partyka, 2002, Amplitude responses image reservoir: accessed February 20, 2008. Boashash, B., 2003, Time frequency signal analysis: A comprehensive reference, Elsevier, Oxford, UK. Fahmy, W. A., G. Matteucci, D. Butters, J. Zhang, and J. Castagna, 2005, Successful application of spectral decomposition technology toward drilling of a key offshore development well: 75th Annual International Meeting, SEG, Expanded Abstracts, 262–264. Guo, H., K. J. Marfurt and J. Liu, 2009, Principal component spectral analysis: Geophysics, 74, 35 – 43. Guo, H.,K. J.Marfurt, J. Liu, and Q. Dou, 2006, Principal components analysis of spectral components: 76th Annual International Meeting, SEG, ExpandedAbstracts, 988–992. H, Sattari., A, Gholami., H. R. Siahkoohi., 2013, Sparsity based short-time Fourier transform and applications in thin bed characterization: Iranian Journal of geophysics, 7-3, 36-48. Li, D., and Castagna, J., 2013, Modified S-transform in time-frequency analysis of seismic data: SEG Technical Program Expanded Abstracts 2013: pp. 4629-4634. Liu, J., and K. J. Marfurt, 2007a, Instantaneous spectral attributes to detect channels: Geophysics, 72, 23–31. Liu, J., and K. J. Marfurt, 2007b, Multicolor display of spectral attributes: The Leading Edge, 26, 268–271. Lu, W., and Li, F., 2013, Seismic spectral decomposition using deconvolutive short-time Fourier transform spectrogram: GEOPHYSICS, 78(2), V43-V51. Mallat, S., 1999, A wavelet tour of signal processing, 2nd edition, Elsevier, USA. Nikoo, A., Roshandel kahoo, A., Nejati kalatah, A., and Hassanpor, H., 2012, Buried channel detection using reduced interference distribution: International Geophysical Conference and Oil & Gas Exhibition, Istanbul, Turkey, 17-19 September 2012. Onstott. Gregory E, Backus. Milo M,Wilson. Clark R, Phillips. J. D, 1984, Color display of offset dependent reflectivity in seismic data: SEG Expanded Abstracts 3, 674. Qiang, Z., and Wen-kai, L., 2010, Spectral decomposition using deconvolutive short time Fourier transform spectrogram: 80th Annual International Meeting, SEG, Expanded Abstracts, 1581–1585. Roshandel Kahoo, A., Nejati kalatah, A., 2011, High resolution spectral decomposition and its application in the illumination of low-frequency shadows of a gas reservoir: Iranian Journal of geophysics, 6-1, 61-68. Sadeghi, M., Roshandel Kahoo, A., Siahkoohi, H. R., and Heidarian, A. R., 2012, Demonstrating buried channels using (RGB) color stack method: Iranian Journal of geophysics, 6, 62-72. Sadeghi, M., Roshandel Kahoo, A., Siahkoohi, H. R., and Heidarian, A. R., 2013, Demonstrating buried channels using principal component analysis: Earth and Space Physics, Institute of geophysics, Tehran University, 40, 45-56. Stark, T. J., 2005, Anomaly detection and visualization using color-stack, cross-plot, and anomalousness volumes: 75th Annual International Meeting, SEG, Expanded Abstracts, 763–766. Statistics Toolbox © COPYRIGHT 1993–2006 by the MathWorks, Inc.
Stockwell, R. G., Mansinha, L., and Lowe, R. P., 1996, Localization of the complex spectrum: The S transform: IEEE Trans. Signal Process., 44, 998–1001. Theophanis, S., and J. Queen, 2000, Color display of the localized spectrum: Geophysics, 65, 1330–1340. Wigner, E. P., 1932, On the quantum correlation for thermodynamic equilibrium: Phys. Rev., 40, 749-759. Zarei, M., Roshandel Kahoo, A., and Siahkoohi, H. R., 2012, Gas detection using deconvolutive short time Fourier transform: International Geophysical Conference and Oil & Gas Exhibition, Istanbul, Turkey, 17-19 September 2012.